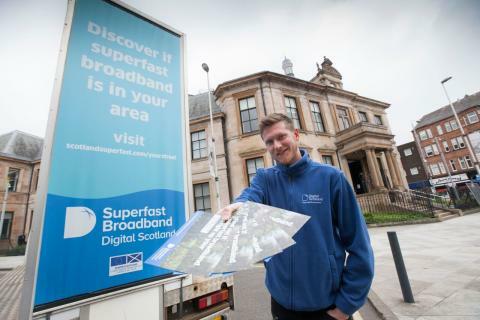 To help promote the fact that fibre broadband is widely available in Glasgow, the Digital Scotland Superfast Broadband team were out and about in Maryhill this week to continue their ‘Up your Street’ campaign. The van stopped off at Maryhill Burgh Hall before heading around the city. More than 88,000 homes and businesses across Glasgow can now upgrade to faster fibre broadband through the £428 million Digital Scotland Superfast Broadband rollout. Local people need to sign up for the new, faster services with an internet service provider, as upgrades are not automatic. Across Scotland, more than 890,000 premises are able to connect to the new network thanks to the Digital Scotland rollout. Areas in Glasgow to benefit from the programme, led by the Scottish Government, include Govan, Castlemilk, Cranhill and Garnethill. More local coverage will follow as engineers from Openreach – Scotland’s digital network business – continue work on the ground. Across the country nearly 4,500 new fibre street cabinets are now live and more than 11,000km of cable has been laid by engineers. Fibre broadband offers fast and reliable broadband connections at speeds of up to 80Mbps1 and there are many suppliers in the marketplace to choose from. Councillor Angus Millar, Chair of the Digital Glasgow Board, said: “I am delighted that areas across Glasgow can access fibre broadband thanks to the programme and more people are now able to get a superfast speed. Whether you are developing a small business, downloading a box set, or just keeping in touch with friends, fibre broadband can make it all happen easily." Robert Thorburn, Fibre Broadband Director for Openreach in Scotland, said: “As the rollout nears its end stages we’re reaching some places, even in urban locations, where the engineering challenges are more significant. We’re increasingly using ultrafast Fibre-to-the-Premises (FTTP) to deliver the network directly into some individual dwellings, including in places like Govan.